Maverick street minister Artur Pawlowski had defeated city hall — again. 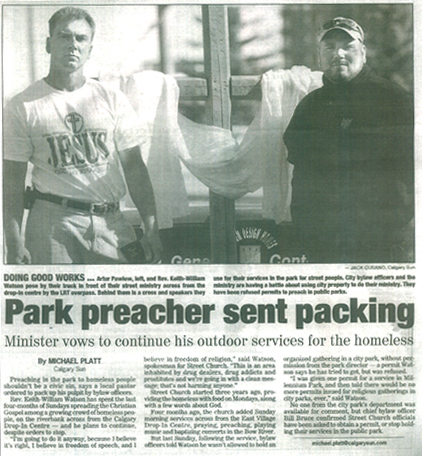 A provincial court judge ruled Monday Pawlowski’s Charter rights were violated when his Street Church Ministries was charged under Calgary’s parks bylaws. Judge Anne Brown said rules prohibiting providing free food, posting signs and gathering people for his services breached Pawlowski’s freedom of religion. She rejected the same argument on a charge of using an amplification system in a park as not violating his religious freedoms, but breaching his freedom of speech. “There is no nexus established between amplifying sound and religious expression,” Brown said, in only accepting the second ground of defence lawyer Michael Bates’ argument. Outside court a pleased Pawlowski, who also defeated several bylaw and traffic charges last year relating to his ministry, applauded the ruling. “A total victory — again,” he said. Pawlowski did plead guilty to a charge of placing an electrical cord across a sidewalk, but Brown said because he had to fight the other charges she would only impose a $1 fine. “Feeding people is permissible and is saved by the Charter,” Pawlowski said. He suggested the latest ruling may make city officials more willing to work with him. “I think they are ready to sit down and talk,” Pawlowski said. “That’s what we want,” he added. City prosecutor Ola Malik said he will have to wait to see Brown’s written decision before deciding whether to appeal. The decision last year acquitting Pawlowski of bylaw and traffic offences in which a judge said the city’s conduct bordered on an abuse of process is under appeal.